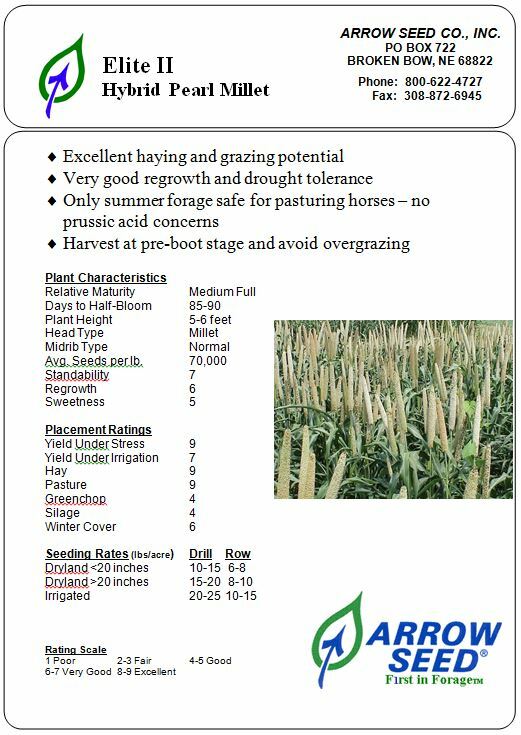 Elite II Hybrid Pearl Millet is a medium tall growing Hybrid Pearl Millet that will reach a height of 6-8.5 feet under optimum growing conditions. It also tillers profusely with abundant leaves 1″ to 2″ wide making it very leafy with a fine stem and excellent hay and it also does extremely well under irrigation because it is not as drought tolerant as types with sorghum parents.. Reaching pre-boot stage in 60 to 75 days makes it a good choice to take a cutting and grazing the regrowth in the fall. The only summer forage that is safe for pasturing horses.